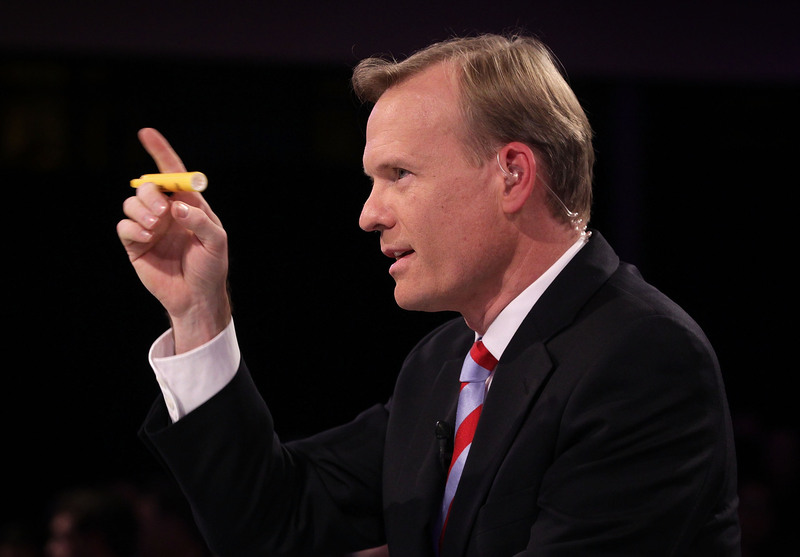 The eleventy-billionth Republican debate of the 2016 cycle is on Saturday, and it'll be moderated by a top-notch reporter: CBS's John Dickerson. Widely-respected among his peers in the industry, Dickerson is lauded for his disarming, brutally-effective style of interviewing, which has given birth to the term "Dickersonian." In preparation for the next debate, let's take a look at John Dickerson's most memorable "Dickersonian" questions, because we'll almost certainly hear some more of them on Saturday. Dickerson doesn't just fire aggressive questions at his subjects right off the bat. His approach is far more subtle than that. First, he'll take a cutting and extremely disarming question and figure out how to phrase it in the most innocuous, bland manner possible. Then, using his own naturally laid-back demeanor, Dickerson will ask the question to one of his subjects in such a subdued manner that he'll almost seems bored. Sometimes, he'll stretch this out over several questions, leading his subjects into a false sense of security... before casually leading them to their rhetorical demise. This style, which has been likened to slowly boiling a frog that doesn't know it's being boiled, has resulted in the humiliation of many politicians, including one former president of the United States. Let's take a look at some of them. In the last campaign, you were asked a question about the biggest mistake you'd made in your life, and you used to like to joke that it was trading Sammy Sosa. You've looked back before 9/11 for what mistakes might have been made. After 9/11, what would your biggest mistake be, would you say, and what lessons have you learned from it?" I wish you would have given me this written question ahead of time, so I could plan for it. Uhhh, John, I’m sure historians will look back and say, 'gosh, he could have done it better this way, or that way.' You know, I just — I’m sure something will pop into my head here in the midst of this press conference, with all the pressure of trying to come up with an answer, but it hadn’t yet. You say that Senator Sanders took a vote that — on immunity that you don't like. So if he can be tattooed by a single vote and that ruins all future opinions by him on this issue, why then isn't he right when he says your wrong vote on Iraq tattoos you forever in your judgment? That's a fair question, and it led to an informative four-way exchange between Clinton, Sanders, Dickerson, and Martin O'Malley. You said: "The American people see a rigged game, where insiders get rich and the middle class pays the tab." Now, that's coming from you. We talked to Mayor Bill de Blasio of New York. It could have come from him. Could have come from Senator Warren of Massachusetts. Uhh, so, talk about that a little bit. This was extremely devious. Dickerson leads with a quote from Perry himself, then references two of the most prominent liberal Democrats in the country, and then just sort of leaves it on Perry's lap to deal with. Perry's response was a complete mess; he first attacked Wall Street, then attacked financial regulations, then explicitly endorsed financial regulations, then attacked them again. All in response to what was, all things considered, a pretty vague, open-ended question on Dickerson's part. Dickerson tripped up the second of the Brothers Bush in late 2014, when he probed Jeb about his strategy for defeating ISIS. He referenced an ad Bush had put out in which he'd accused his opponents of "whining" about ISIS, and asked a simple question: Who is whining? DICKERSON: Are those advisers not being consulted? CARSON: Whether they're being consulted or not is irrelevant if we're not paying attention to what they're saying. DICKERSON: And what do you think that they're saying that is not being paid attention to? CARSON: If we're trying to micro — if we're trying to micromanage them — I think they're being micromanaged. DICKERSON: In what specific way? CARSON: All you need to do is go out and talk to a number of the generals who have retired, in many cases prematurely. They can give you a very good answer to what I'm just talking about. DICKERSON: But you — do you have an answer to that question? CARSON: My answer is for you to go out and talk to them and ask them specifically. You want to know the exact reasons why we're not winning and ask what advice has been given and how it has been ignored, I would suggest that you talk to them. It was clear, in other words, that Bush did not have an answer to that question. During the 2008 campaign, Dickerson chimed in on a conference call to ask Hillary Clinton's campaign team about her foreign policy credentials. "What foreign policy moment would you point us to in Hillary's career where she's been tested by crisis?" Dickerson asked. What followed was a long, long pause. So long that, in the words of one reporter on the call, that "you could've knit a sweater in the time" it took for them to respond. When Clinton's advisers finally did reply, they were halted and stumbling, and couldn't come up with a good example — which seriously damaged Clinton's argument that her opponent, Barack Obama, was not adequately tested in the foreign policy arena.